<article> element is used to defined the self-contained content. <article> tag is specifying the independently or reusable. The source of the <article> element is: News story, comment, Blog post. The <article> tag supports Global and Event Attributes. <article> tag belongs to Palpable content, Flow content and Sectioning content. HTML 4 does not supports <article> tag. The <article> tag is new in HTML 5. <article> tag is used to defined the article name, information of the article, author name of the article and released date of the article (Like blog, forums). 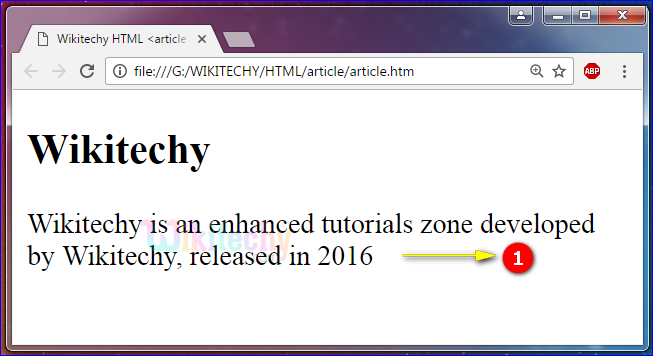 The output is displayed with the article name (Wikitechy), Information of the article (enhanced tutorials), Author name (Wikitechy) and released date (2016).